Yahoo! Research, with their minds bent on “the next generation of search,” have come up with a unique way of viewing how tags have evolved over time on Flickr. Tags are like keywords that are assigned to millions of photographs by Flickr members. 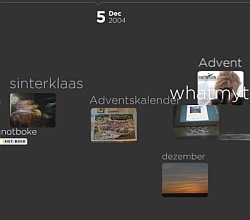 The Taglines project gives a visual representation of the top tags and photographs associated with those tags for each day from June 4, 2004, through September 16, 2005. Clicking on any tag as it drifts by loads additional photographs and pauses that tag for a while so you can examine it more closely. Pretty neat.